Simplify workplace health and safety. 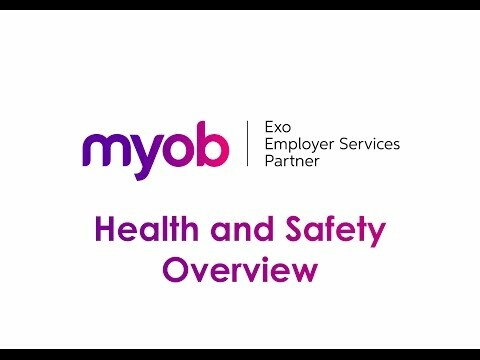 MYOB Exo Health & Safety is a health and safety management solution to simplify and systematise your workplace safety obligations. Effective management of workplace safety obligations is a vital part of a growing business. Protecting your staff from harm is paramount and it will protect your business from the costly consequences of breaching health and safety obligations. User-friendly software design steps you through a simple process to track hazards and incidents, as well as plan policy and health and safety procedures. To gain discounts on ACC Workplace Cover levies, use MYOB Exo Health & Safety in conjunction with ACC Workplace Safety Management Practices Program. Achieve compliance with safety laws with features like document management for visitor logs, medical and contractor providers. Manage tasks and hazards requiring special training before an employee undertakes tasks. Pre-define hazards for a register, and automatically assign job requirements and training when specifying risk areas for any employee. A powerful reminder function for notes, hazard checks, training and job requirements is fully integrated with MYOB Exo Employee Information. Document manager records site visits, safety equipment records, medical details and contract providers.